inspired by the roses growing over trellises in the garden at the Red House, the classic Arts and Crafts movement’s home at Bexleyheath, in Kent. motifs are drawn in a simple, naïve style reminiscent of the woodcut images in 16th- and 17th-century herbals. Morris collected these early printed books and often took his inspiration from their simple, stylized illustrations. Trellis was the first attempt of Morris at a wallpaper design, but was also one of his favorite designs. He chose it to decorate his bedroom at Kelmscott House in London, where he spent his final years. This motif represents a grid with a bush of roses growing on a regular-shaped grid , thus creating a high contrast between the flowing lines of the roses and the uniformity of the grid. 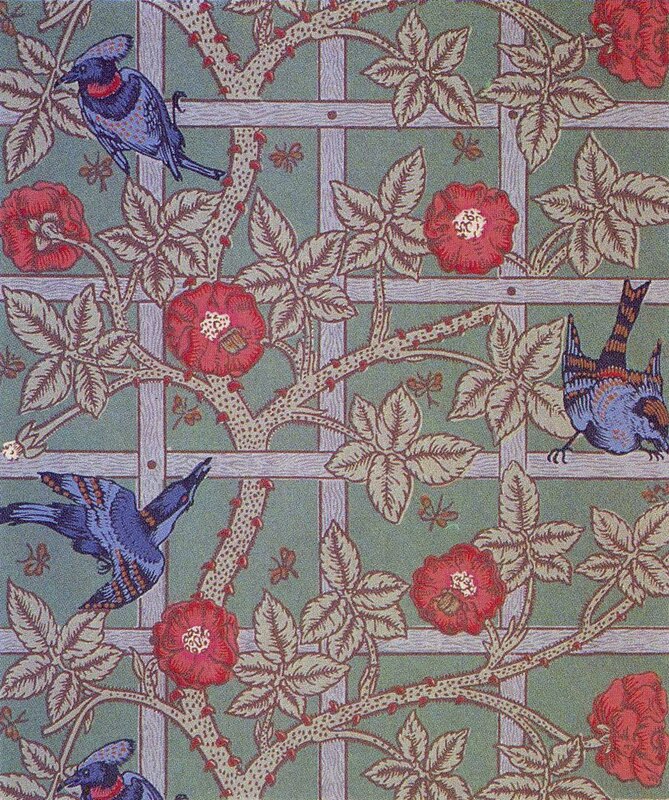 The blue birds and the insects were later added by Philip Webb, the architect of the Red House, for the final design. 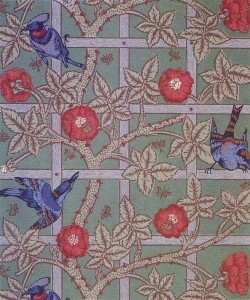 William Morris is one of the most important exponents of the Arts and Crafts Movement. He thought that the artist should be a craftsman-designer who takes pleasure in is work, like in the Middle Age. Middle Age was considered by the exponents of the ACM “a period of greatness in the art of common people”. “Trellis” perfectly shows this attitude, since the motif was inspired by the decorations of the medieval period.